the increased likelihood of spinal injury due to the prevalence of precipitating Mechanisms of Injury which (with the exception of vehicle accidents) are more commonly seen in these environments than in more domestic or urban settings. the implications and difficulties of extended care and a protracted evacuation from these environments. Spinal Boards are an extrication device and not a stretcher. Due to the risk of pressure sores, the casualty should be on one for no more than 30 minutes (possibly extended with padding). (5) Once immobilised a clinician will be unwilling to ‘clear’ a spinal injury until satisfied by not only X-Ray but also CT scanning once in the ED. How long will your casualty be immobilised for whilst waiting for help and during transit? Cervical Collars are not a panacea and come with their own issues including difficulty in application due to aggressive / combative casualties or bulky clothing, difficulty in correct sizing leading to ineffective immobilisation, potentially forced extension of the spine and increased intracranial pressure. Despite the low incidence of Spinal or Spinal Cord Injury and the potential issues with unnecessary and/or prolonged Immobilisation, because of the extreme consequences of a mis-diagnosed or mismanaged casualty as well as the potential litigious costs it is understandable that there is reluctance to apply a more relaxed approach. Structured guidance would allow the pre-hospital practitioner to make an informed decision which provides best care for the casualty with a suspected spinal Injury whilst negating the need to immobilise those at low risk. The National Emergency X-Radiography Utilization Study (NEXUS) Low-Risk Criteria was first introduced in 1992. There have been various amendments since then to increase both accuracy and application. Both NEXUS and CCSR have nearly 100% accuracy in successfully identifying significant spinal injury but have with them their own issues in application and limitations in studied examples13. 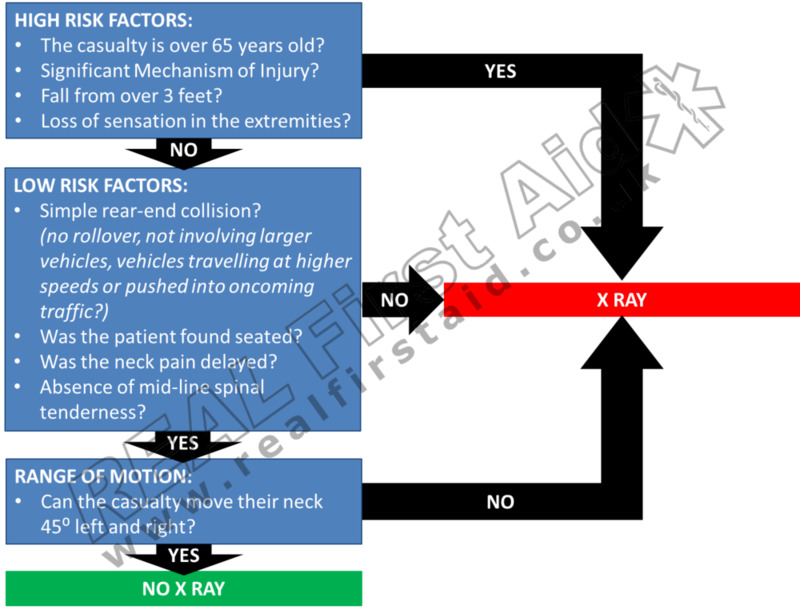 The Joint Royal Colleges Ambulance Liaison Committee (JRCALC) Guidelines (2013) advocate the use of the NEXUS rules for clearing a spinal injury5 while the National Institute for Health & Care Excellence (NICE) Guidelines (2014)14 advise clinicians to apply NEXUS based rules to eliminate low-risk factors before assessing the casualty using a CCSR based assessment. 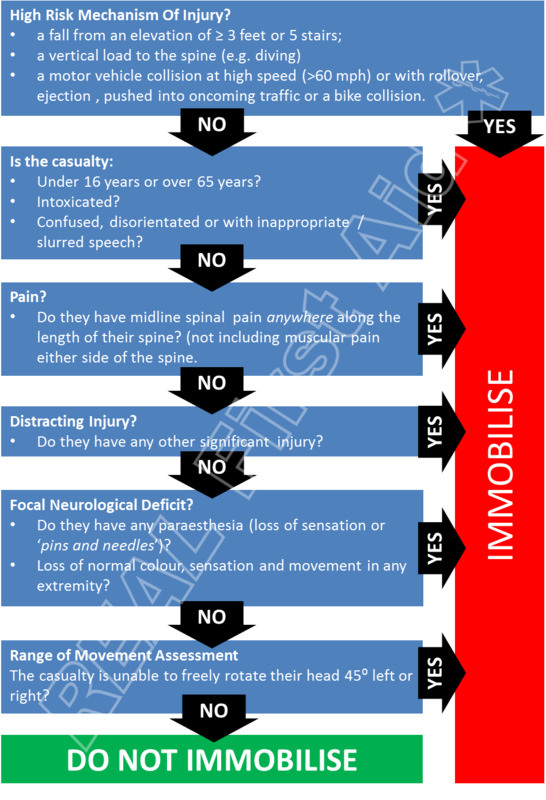 To begin with there must be a significant MOI to warrant Immobilisation; both algorithms place significant MOI as the most credible factor in suspected Spinal Injury. The NEXUS and CCSR rules contradict each other on the validity in age groups either side of 16-65 years. This model errs on the side of caution. Given the high prevalence of cervical spine injuries alongside thoracic and lumber spine injuries together with recommended immobilisation for all spinal injuries, this model includes pain along the length of the spine, not just the cervical spine. Range of movement is assessed only after all other factors have been ruled out. Cameron P, Bagge B, McNeil J, Finch C, Smith K, Cooper D, et al. (2005) “The trauma registry as a statewide quality improvement tool”. Journal of Trauma. 59:1469-1476. Spinal Cord Association. (2009) “Preserving and developing the National Spinal Cord Injury Service: Phase 2 - seeking the evidence”. Totten VY, Sugarman DB. (1999) “Respiratory effects of spinal immobillzatlon.” PrehospitalEmergency Care, 3: 347–52. Chan D, Goldberg RM, Mason J, Chan L. ( 1996) “Backboard versus mattress splint immobilization: a comparison of symptoms generated.” Journal of Emergency Medicine. 14: 293–8. Lerner EB, Billittier AJ, Moscati RM. (1998) “The effects of neutral positioning with and without padding on spinal immobilization of healthy subjects.” Prehospital Emergency Care. 2: 112–6. 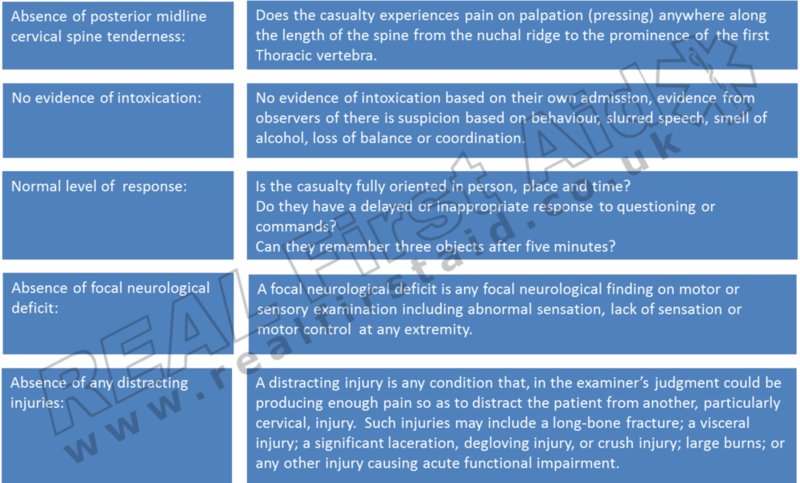 Hauswald M, Braude D. (2002) “Spinal immobilization in trauma patients: is it really necessary?” Current Opinion in Critical Care. 8:566-570. Andrew Eyre, (2006) “Overview and Comparison of NEXUS and Canadian C-Spine Rules”. American Journal of Clinical Medicine. Volume 3, No. 4.